Of all the motorcycle experiences I'd imagined, riding around zebras and giraffes in Africa’s Great Rift Valley wasn’t on the list. Not until recently, that is, when I took an adventure ride in Kenya. Yes, the East African nation — better known for safaris and champion distance runners — has a budding ADV-moto scene. And tapping into it to do a two-wheel tour is actually more accessible to John and Jane Q. Public than many would expect. I’m glad I did because Kenya is God’s country for adventure riding. Several established motorcycle tour companies operate in the nation of 48 million. There’s Motorbike Safari near Mombasa or Tomoto Tours out of Nairobi. You can get a direct flight from the United States to Kenya and U.S. passport holders can pay $50 to get a visa on arrival with no advance paperwork. During a recent East Africa business trip, my quest for an ADV ride led me to Lawrence Wacla, founder of MotoADV Kenya. I called him from New York to talk adventure riding in Africa. Wacla’s an expert on guided motorcycle tours. He’s crisscrossed North America, done the three-country Lake Victoria ride, and guided trips into Uganda and Rwanda. Wacla also rode the 3,000 miles from Kenya to South Africa. Lawrence Wacla's guided tours in Kenya include varied and sometimes rugged terrain. MotoADV Kenya photo. He contrasted ADV riding expectations in the United States and Europe vs. Kenya. 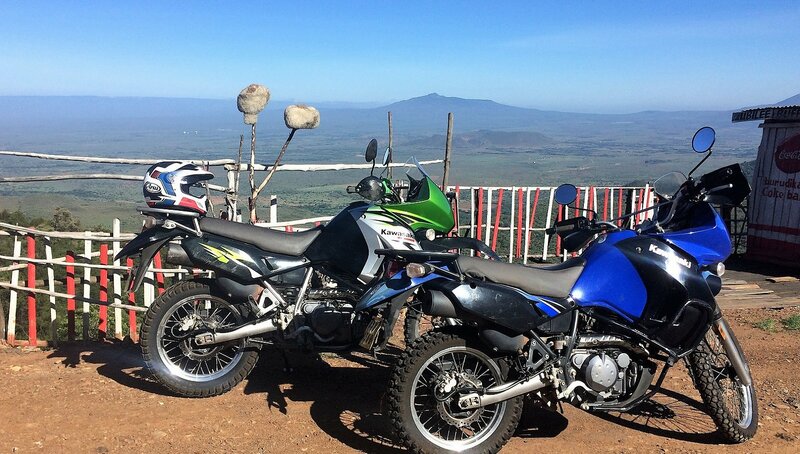 Wacla’s MotoADV bike and gear shop runs several tours in Kenya and East Africa. They rate them by toughness and terrain, the most challenging being The Great North Frontier Run, at 90 percent unpaved and eight out of 10 in difficulty. His preferred bike for East Africa’s challenging terrain and maintenance environment? Kawasaki’s KLR 650. A water crossing during a MotoADV Kenya guided tour. MotoADV Kenya photo. Though Wacla would be out of the country when I was in Kenya, he agreed to hook me up with one of his guides for a mini-tour outside Nairobi. This was supposed to be a short ride of just an hour or so, because it was my last day in country, a Saturday, and I had an evening flight to Kigali. We’d keep it short and simple. A week later I showed up at 7:30 a.m. at Wacla’s Nairobi shop geared up and ready to go. There, I met my guide, Andrew Muriithi, a telecom exec on the weekdays and avid adventure rider anytime else. Unsurprisingly, the bikes for the day were KLR650s. After a few words of introduction, we fired up the Kawasakis and hit the road. As ADV experiences go, riding motorcycles on the roads in and out of Nairobi is an adventure unto itself. Describing Kenyan riders as serial lane-splitters wouldn’t be accurate. Kenyans pass through gaps just centimeters from bars to cars that Americans would never imagine splitting. This includes passing on sidewalks, roadsides, and even the center line space between the car ahead and oncoming trucks. I followed my guide through the first two of those options, but yes, I definitely skipped that last move. My guide, Andrew Muriithi, agreebly extended what was supposed to be a one-hour ride trip into a day-long, 80-mile trip into Kenya’s interior to Lake Naivasha. Photo by Jake Bright. When Andrew and I finally cleared the Nairobi-Nakuru Road, we stopped at a Rift Valley lookout. That’s when my eyes opened wide to adventure motorcycling in Kenya. The view was an endless expanse of sweeping country, green, and trails. It was like looking through a panoramic window into ADV paradise. Riding down into the valley, we stopped by a remnant of Kenya’s British colonial days, the Mai Mahiu Church, built by Axis power POWs during World War II. Photo by Jake Bright. Riding down into the valley, we stopped by a remnant of Kenya’s British colonial days, the Mai Mahiu Church, built by Axis Power POWs during World War II. We could have turned around there, but the view had lured me in. I asked Andrew if we could extend. He rerouted to take us deeper into the Rift Valley, roughly 50 more miles to the Ranch House Bistro on the shores of Lake Naivasha within Oserengoni Wildlife Sanctuary. Even a day ride out of Nairobi provides opportunities to take in great views and wildlife. We were off. Along the way we veered onto some side trails and passed Mt. Longonot. The vastness of Kenya outside Nairobi really struck me. There were dirt roads and trails in every direction, all begging to be explored. Lawrence Wacla’s points about the ruggedness and unpredictability of the country’s terrain materialized at my front wheel. Rains days before had created an unpassable, three-feet-deep gorge across the trail. There was plenty of space to redirect across a pasture. This Kenyan traffic jam is mostly sheep, with a couple of KLR650s. Photo by Andrew Muriithi. As our adventure ride rolled closer to Lake Naivasha, we started to encounter plenty of non-vehicular company. It started with goats and sheep and soon enough came wildlife. I discovered that once far enough out of Nairobi the entire country becomes a game reserve. Wild boars, gazelles, and monkeys started appearing. Zebras were on the periphery. Seeing a giraffe cross in front of my motorcycle was a definite first. As I was scanning for giraffes near Lake Naivasha, another one crossed the road behind me. That's definitely a road hazard to pay attention to. Photo by Andrew Muriithi. This was different from my mental image of viewing wildlife in Kenya while standing in the back of one of those old Range Rovers. Zebras roam freely in the Rift Valley. Photo by Andrew Muriithi. The remainder of the ride to and back from our Lake Naivasha lunch qualified as epic. My one-hour trip had turned into an entire day and Andrew and I had bonded as biking brothers in a way that required few words. An obligatory selfie, me and my guide. Photo by Andrew Muriithi. There are moments on a motorcycle where you feel the air, take in big blue sky and become one with the bike and surroundings. If the synapse had a subtitle it would read “this is completely awesome and why we do this.” That definitely flashed in my head multiple times on the Kenya trek. The moments were bittersweet, however, as before the ride concluded I was already bummed about not having time to explore more. I made my evening flight to Rwanda, but my mind lagged behind, scheming for ways to ride more in Kenya. If you're thinking about going big, MotoADV Kenya offers options ranging up to 10-day tours that include motorcycle rental, meals and lodging, but shorter two-night, three-day rides are also available for a cost of about $950. A day-long guided excursion like the one I did costs about half that. For those of you in the states who love adventure motorcycle riding, I recommend a trip to Kenya. Do a wildlife safari the way any good biker should, on two wheels.